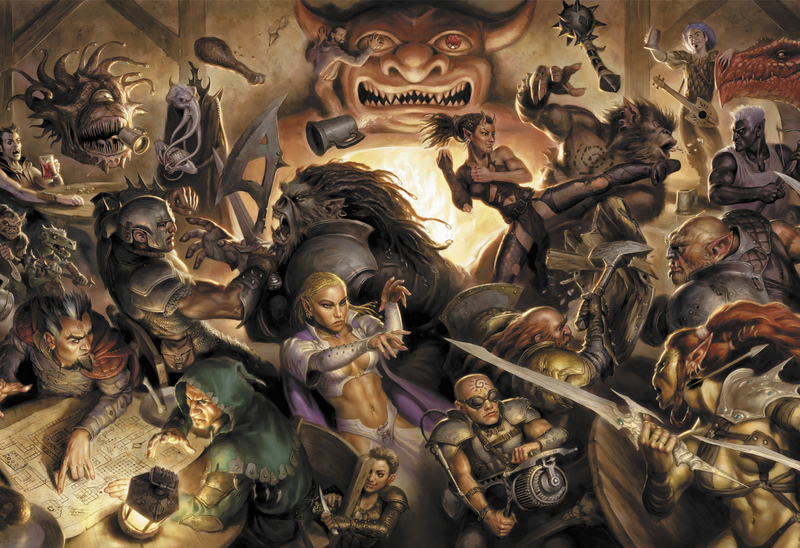 Tenkar's Tavern: What Makes an RPG an RPG? 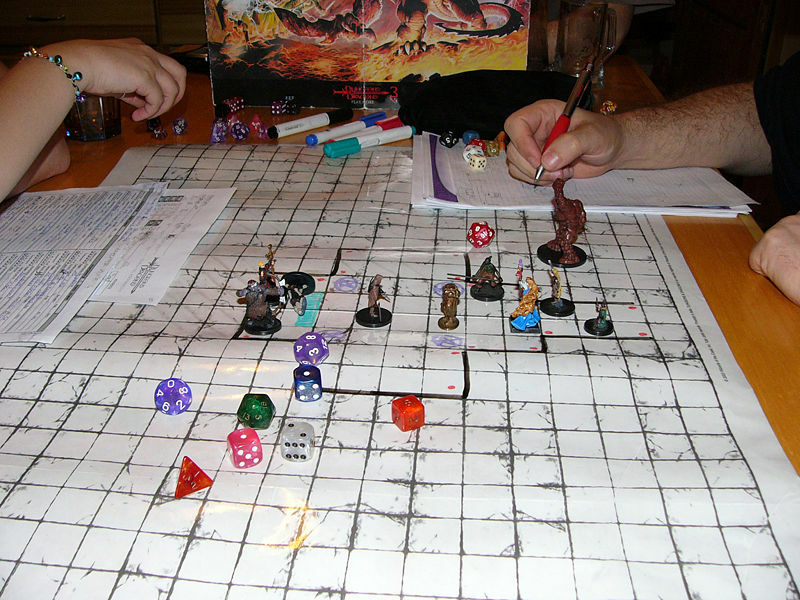 Tabletop or pen-and-paper (PnP) RPGs are conducted through discussion in a small social gathering. The GM describes the game world and its inhabitants. The other players describe the intended actions of their characters, and the GM describes the outcomes. Some outcomes are determined by the game system, and some are chosen by the GM. This is the format in which role-playing games were first popularized. The first commercially available RPG, Dungeons & Dragons (D&D), was inspired by fantasy literature and the wargaming hobby and was published in 1974. The popularity of D&D led to the birth of the tabletop role-playing game industry, which publishes games with a wide variety of themes, rules, and styles of play. Personally, I think that definition is kinda vague, but maybe we do need a vague definition. 4e players (alright, some of the more vocal proponents) often the see Old School RPGs, where the GM is empowered and not every situation has a rule as some sort of glorified group story telling event. Old School players (I'll include myself so you know where to aim the slings and arrows) see 4e as a glorified board game / individual sized unit wargame hybrid. I'm surprised it lacks rules to define when, where and what dice to roll when you PC has to defecate (that's a joke son. as in taking the situation and making an extreme example. no 4e players were truly harmed making this comment). So, lets take a step away from D&D and it's various incarnations for a moment, and take a some classic RPGs. RuneQuest - very lethal combat. Where you might get into combat in Rolemaster to play with the crit charts, a wise party avoided combat whenever possible. Skill based, you generally sucked and most stuff until you got further along. Paranoia - specifically first edition - death was inevitable, even fun. Keeping th pace moving was the key. The rules had more holes then swiss cheese. Call of Cthulhu - lethal combat. Letha game. Your C might do something heroic, but they weren't heroes. Warhammer Fantasy Roleplay - great atmosphere, amazing setting, engaging PC history built into the career system. Fairly crappy game system, but so much fun we didnt care. Traveller - lethal combat. Your starting skills were your skills for life. No expo ladder to climb. Best sci-fi RPG I ever played, bar none. Tunnels & Trolls - an early fantasy RPG without the funny dice. Horrid layout in the rulebook, excellent simple system for role playing. Less rules then even OD&D from covering situations. So, we went from no grid, to an optional grid (3e), to a necessary grid (3.5e and 4e) possibly back to an optional grid (5e). How many other games require a grid these days? I played in a Warhammer 40k Dark Heresy campaign for a bit - no grid. I don't think any of the FATE system based RPGs require a grid. Mongoose RQ2 / Legend? Doubt it, could be wrong. Pathfinder? It's like 3.75 D&D, so i think the grid is etched into the system. Heck, most of the recent indi RPGs dont require grids. Come to think of it, D&D from 3e on is probably the most heavy game in regards to rules, skills powers and the like (well, excluding the universal games: GURPS, HERO, Rifts (so good, so broken) and such. Heck, even Savage Worlds can break the rules down to a fairly slim, undersized paperback. So, when did D&D decide that more was better? At what point do the rules hinder role play? Heck, do lack of enough defining rules put too much emphasis on role play? Can you put too much emphasis on role play? Is immersion in the game easier with few rules, or do more rules help you define what you want to immerse yourself in? We have had rules heavy RPGs since the beginning of the hobby. Heavy rules and light rules fill their own niches. Where is 5e going to fall in this mess? Is it going to fill more then one niche? Can any game cover both ends of the spectrum? Everyone has an ideal system / style / comfort zone in the role playing hobby. You have to match the player to a system, and then match other players who also match the system. It aint easy. 5e claims it will fill multiple niches. Multiple desires. It will be what you want it to be. A doppelganger if you will. Or a Frankensystem, with a 3e base and other generations of D&D grafted to it. Rules light or heavy, no grid or grid with blast templates, rolled HP or standard advancement - they are different ways to play role playing games. Rules light emphasizes the role play aspect, rules heavy emphasized the game aspect. Maybe 5e will split the baby down the middle. The statement that 4th edition D&D is a board game isn't only made as a criticism. On boardgamegeek.com I've heard a few people say that they prefer 4th edition because it's more like a board game. And you've also go fans of old school or 4e type games that say newer more narrative type rpgs "aren't games." It's all bull. All of them are rpgs, it's just different people have different preferences for the ratio of game to role-play and what precisely they want to have covered by each. I find 4e too "board gamey" for my tastes, but that's just me. It's not "not and rpg!" just because it doesn't fit me. "So, when did D&D decide that more was better?" Whenever Gygax decided to put all his house rules for D&D into two books, apparently in the order in which they sprang to mind, and called it 'Advanced'. And then commissioned the Dungeouneer's and Wilderness Survival Guides. Honestly, I love my 1e rulebooks, but I've only really used them as, in earlier days, as inspiration for what to do with my Mentzer BECM sets, and later, as a source of ideas for other RPGs. A question re: narrative type RPGs. I'm someone who thinks that current D&D is a bit boardgamey, and I've got Heroquest (MB and GW) for that. But I do like games with a bit of crunch - enough rules and tables to make the dice do some work! I was never taken with the Vampire/Werewolf stuff in the 1990s, not only because I found the subject matter and aesthetic too 'goth', but also from what I understood to be the 'storytelling' system. I am one of those people who thought that if you're not rolling dice to see if your character dies in some pointless, rather than narratively required, way, it isn't an RPG. So, not Heroquest, but HeroQuest (Glorantha) - what manner of beast is that? "Whenever Gygax decided to put all his house rules for D&D into two books"
his house rules that he didn't actually use. Where D&D/AD&D Changed...in my humbled opinion, I believe it started with 2nd Ed, and was compounded with the extra skill/rule books that were released in the final years of 2nd before the announcement of 3/3.5 eds. Also, the notion of money being made with new additions had seeded the idea that any expansions/improvements (errata, etc)/flavor of the day, justified the transition. For me, 1stEd worked, 2nd worked (but I had more House rules) and 3.5 core rules settled some nagging changes that were nice to see, sadly a lot of the "option" books that followed, MMOs, and CCGs influenced the younger market so much that it appears WotC reached and grabbed some but lost an older and more supportive group for D&D with "that" 4th Ed monstrosity! The game plays, no matter what edition, how it plays and to who is the albatross to D&D's continued ability to remain in a world of CCGs, MMOs and the computer cultivated. I am content with playing OD&D, 1, 2, or 3.5…. had good times with all of them. D&D is a “Living” game, mutating or growing, however one wants to look at it, with the times and business it generates. Be kind t your Dice… game often!